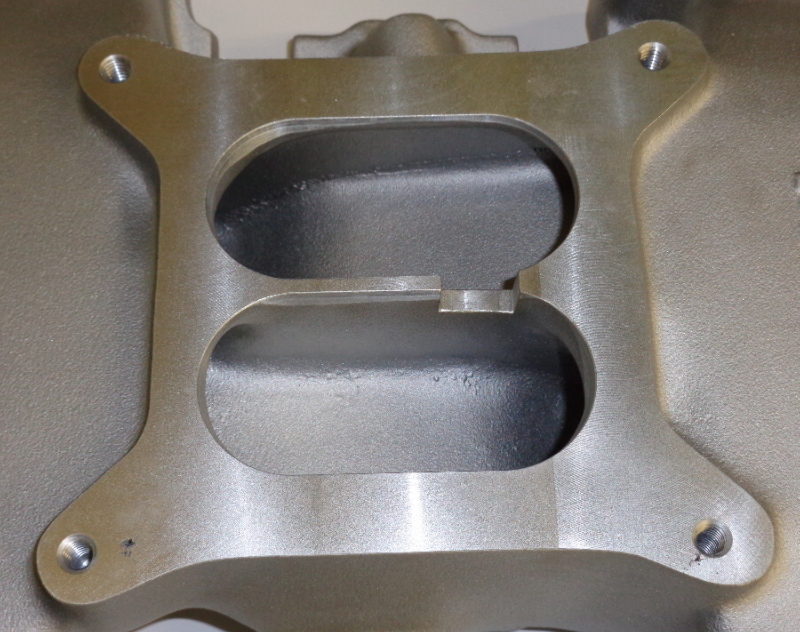 In dyno testing the different intake manifolds on various engines, it’s found that the intake runner and plenum designs are main players in determining what the power curve for a particular engine combination will look like. 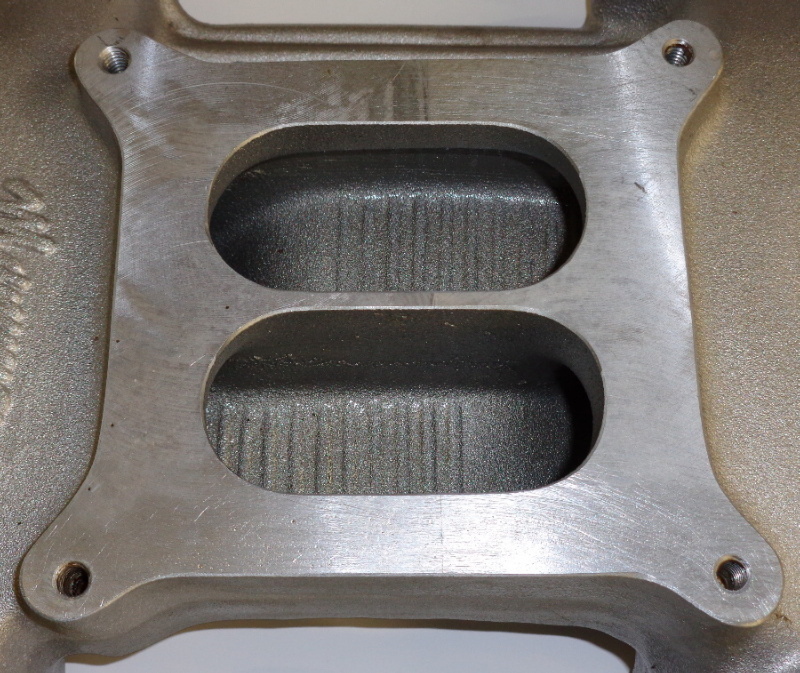 One intake manifold feature that comes to the forefront on the aftermarket four barrel dual plane intakes is a slot in the divider located directly under the secondary side of the carburetor. These slots came into prominence in the late Sixties with the popularity and use of the Holley three barrel carburetors and that slot was simply required to allow the secondary throttle blade on those carbs to open without interference at the intake manifold. 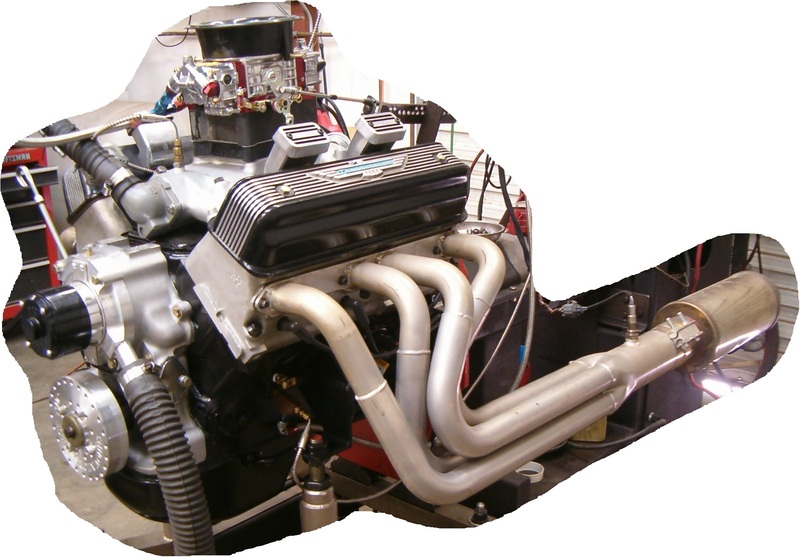 Although the three barrel carbs have been pretty much extinct for several decades, the practice of the intake manifolds being slotted by the manufacturers has remained. When the Blue Thunder intake for the Y engines was introduced, it too had that slot located at the rear of the divider under the secondary portion of the carb. I’ll hence forth refer to that slot as the ‘three barrel’ slot simply due to it working for that purpose. For the Ford Y-Block engines, the two aftermarket intakes currently available are the Blue Thunder (BT) and the Mummert. In breaking with conventional practice, the Mummert aluminum intake manifold was introduced without that ‘three barrel’ slot in place. The BT intake being introduced a few years earlier has the slot. So that begs the question, exactly what effect does that slot have on the engines power curve if any? 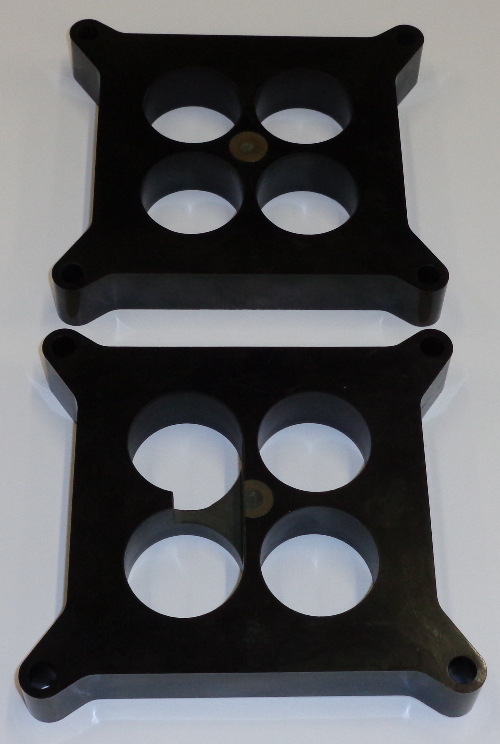 To test the effect of the ‘three barrel’ slot on overall engine performance, four 1” tall four hole carb spacers are obtained and appropriately modified so they can be dyno tested. While one 4 hole spacer is left stock, another is modified with a slot across the secondary throttle bores. The other two spacers are machined so that they are dual ovals closely matching the dual oval configuration used in the plenums of both the Blue Thunder and Mummert intakes. Again, one of the dual oval spacers has the slot added so it’s across the secondary throttle bores while the other does not. To add another nuance to the tests, the slotted spacers are tested both right side up and upside down just to see if this provides an additional difference to the power curve. This makes for six different test variants which includes the four different spacers and then the two slotted spacers being run with slots down as well as slots up. The dyno mule is the well tested +060 over 312 with a set of mildly ported G heads. The intake manifold being used for this test is the Mummert aluminum intake which is being used in lieu of the Blue Thunder intake simply due to the lack of a slot in the plenum divider. The carb is the 750 vacuum secondary Holley which has proven to be a solid performer on this engine in past tests. The camshaft is a Seventies era Crower Monarch grind with 238° duration at 0.050” on both the intakes and exhausts and ground on 110° lobe centers. The cam is installed with 2° of advance (108° intake lobe centerline). The net valve lift is 0.459” lift using the Harland Sharp 1.6:1 roller tipped rockers with the valve lash set at 0.019”. The following chart shows the various dyno results. The *Score is calculated by adding the average torque and horsepower values together, multiplying by 1000 and dividing by the cubic inch (322). In this case, the charts don’t tell the whole story so this is where a series of graphs come into play. 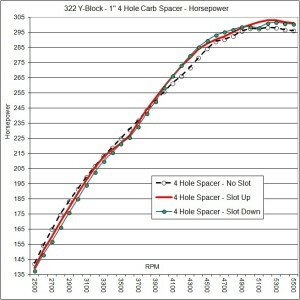 The following two graphs show the HP and TQ results for the four hole spacers. 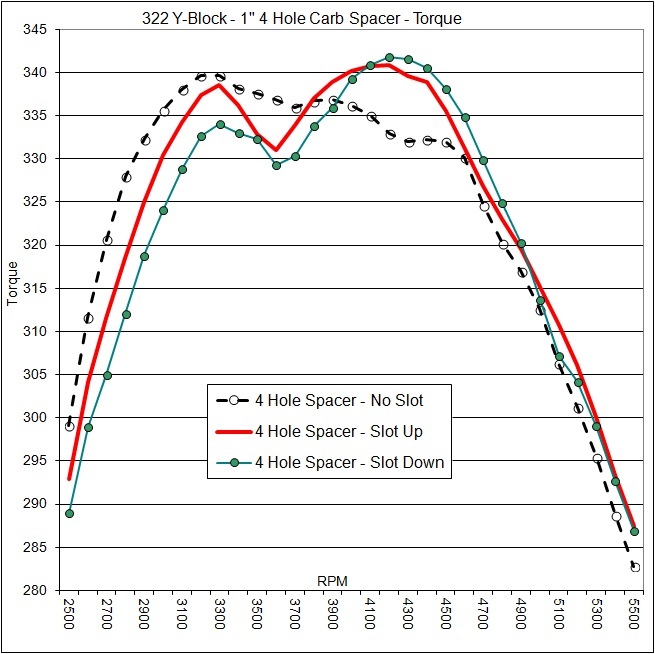 There is a pronounced dip in the torque curve when the slots are incorporated into the spacers versus the dyno runs that are made without the 3 barrel slot in place. 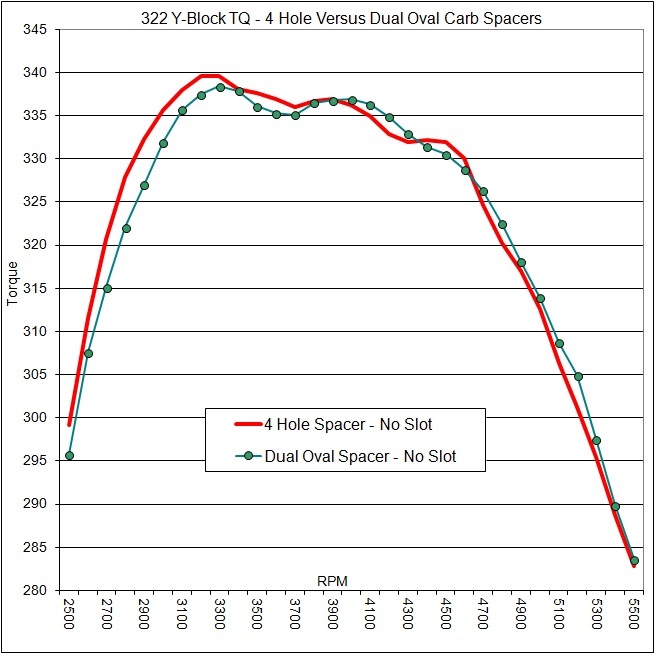 The next pair of graphs shows the results of testing with the dual oval spacers with and without the three barrel slots. 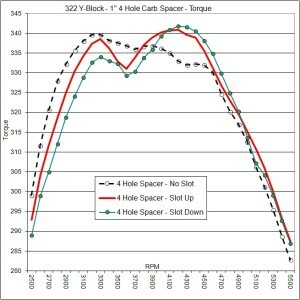 Again, that mid-range dip in the torque curve becomes more pronounced with the slots in place versus without. 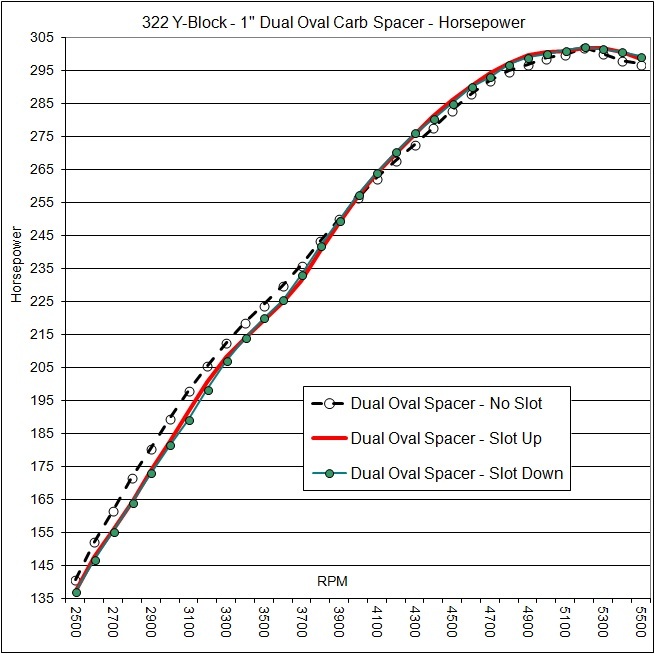 This next pair of graphs simply compares the four hole carb spacer without a slot to the dual oval carb spacer also without a slot. 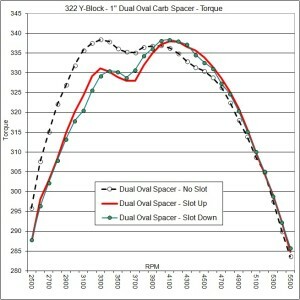 Low end torque is enhanced with the four hole spacer while the top end horsepower is better with the dual oval spacer. No surprise there. 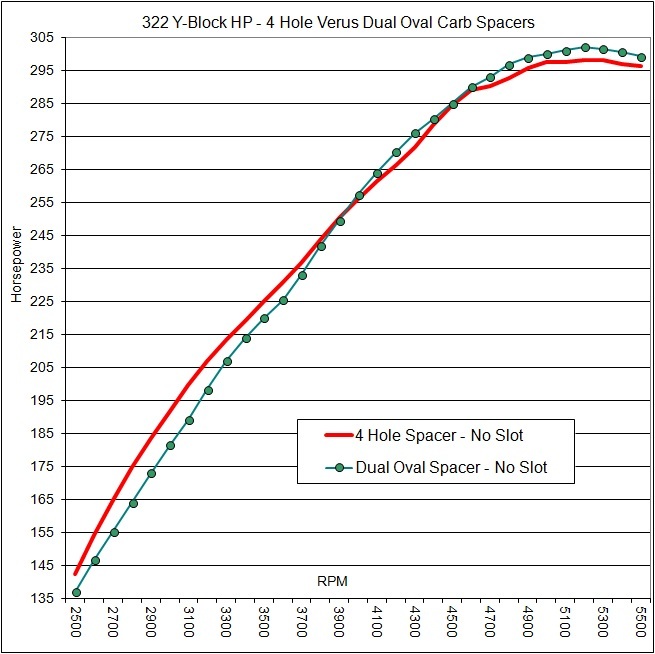 This reaffirms the practice of putting the oval slots in the ECZ-B iron intakes for an increase in top end power. 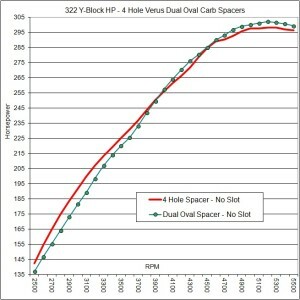 What is obvious on the graphs comparing ‘slot’ versus ‘no slot’ performance is how the addition of a slot does make for a more pronounced dip in the mid range torque values. Based on past experience, that dip or mid-range drop in the torque numbers does look like it can be reduced by simply making the carb spacer taller. For this particular test, the carb spacer height was simply kept at one inch but past testing has shown that the two inch high carburetor spacers are a better choice for optimum horsepower and torque numbers on most Y engine combinations when using either the Blue Thunder or Mummert intake manifolds. There are instances where even more than two inches of spacer works so keep an open mind. 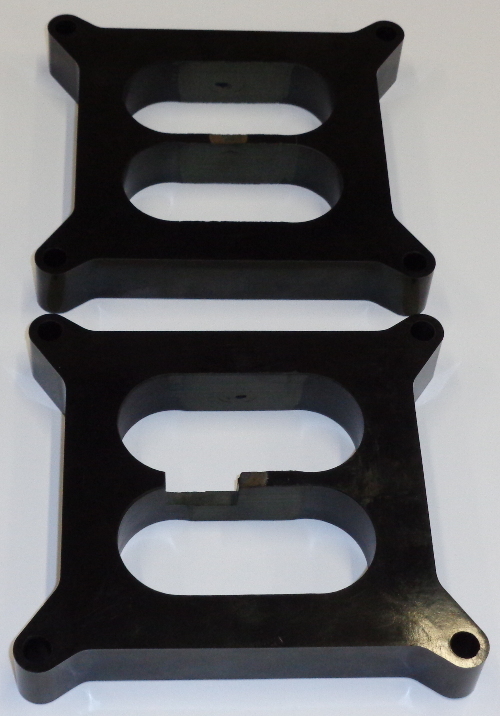 The addition of plenum slots do tend to help the overall performance scores and top end horsepower numbers when used on a 4 hole spacer design. 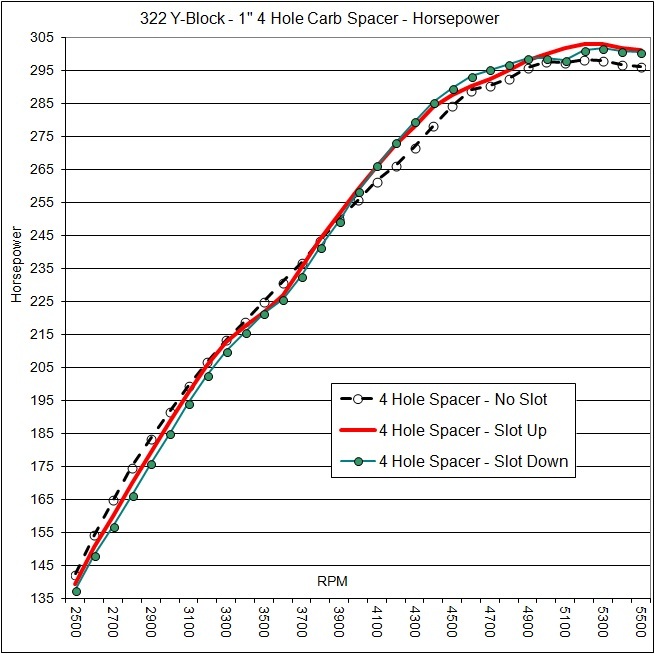 When using ovals under the carbs rather than four individual holes, the same slots prove to be a detriment to the overall score values while top end horsepower values do continue to be higher. 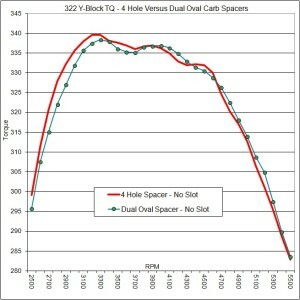 The low end performance is reduced with both spacer designs with the slots when compared to the same ‘no slot’ spacers. 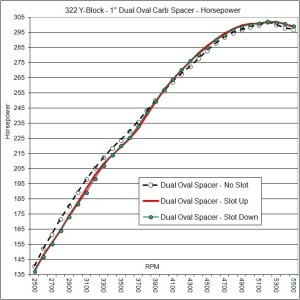 In summary, not having a slot in the plenum divider does enhance the low end torque values so it simply ends up being a case of exactly what kind of driving is being performed as to whether the intake plenum having a three barrel slot or not is going to be the best for a particular engine combination. 585 HP with 3″ of dual slotted carb spacers on Blue Thunder intake manifold. Click on picture for larger image.